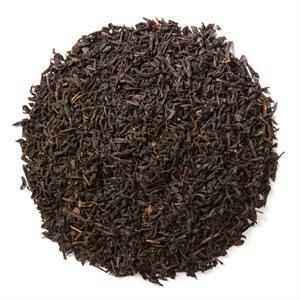 Keemun Congou (Loose Leaf) is a Chinese black tea with a tightly twisted leaf that brews red in the cup. 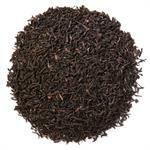 Davidson's Keemun Congou (Loose Leaf) is a robust black tea with wine-like undertones and a smoky finish. 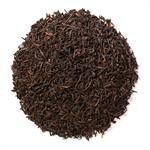 Davidson's sources its Keemun Congou from Qimen County in the Anhui Province of China. 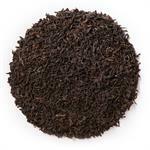 This is an area known as "The County of Chinese Black Tea." The area's high elevation and shady climate protect the tea leaves from direct sunlight, making the tea mellow yet rich. 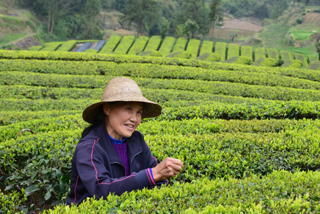 This is an image of a small farmer from the region, stopping to pose while she plucks the young, thin shoots for Keemun Congou.